Unless you’ve been living under a rock, you know that today marks the release of the highly-acclaimed new Star Trek movie. And if you’re at all like me, you’ve spent the week watching sci-fi to get yourself in the mood. Also if you’re like me, France is probably not where you go first for your space opera fix. But perhaps Dante 01 will change that. The whimsical romantic comedy Amelie made a big splash a couple of years ago, introducing French director Jean-Pierre Jeunet to the States. Jeunet had previously collaborated with a co-director named Marc Caro on the post-apocalyptic Delicatessen and the noirish fairy tale City Of Lost Children, both brilliant achievements. But after being demoted to Design Supervisor on the Jeunet’s underrated Alien Resurrection, Caro seemed to have disappeared – or at least, seemed to have been eclipsed by his former partner. Deep space, at the edge of the galaxy. The future. A new prisoner arrives on top security prison ship and psychiatric research unit Dante 01. Sole survivor of an encounter with an alien force beyond imagining, Saint Georges is a man possessed by inner demons, caught up in the battle to control the monstrous power within him. It’s a power that will infect the other highly dangerous occupants of Dante 01, jailers and prisoners alike, unleashing a violent rebellion that turns this terrifying, labyrinthine world upside down. In the otherworldly hell of the ship’s depths, through danger and redemption, each must journey to his very limits… each must confront his own Dragon. There are plenty of criticisms one could raise: the “symbolism” could have been more subtle (or subtle at all! ), the character-development felt rushed in parts, and some of the effects showed signs of budgeting. BUT as far as sucker-punches go, this one takes the cake. So… can anything good come from France? The answer is yes, especially if by “good” you mean claustrophobic space-prison dramas with Gospel over-tones. Next stop – the final frontier! DZ- I am also totally looking forward to seeing Star Trek! 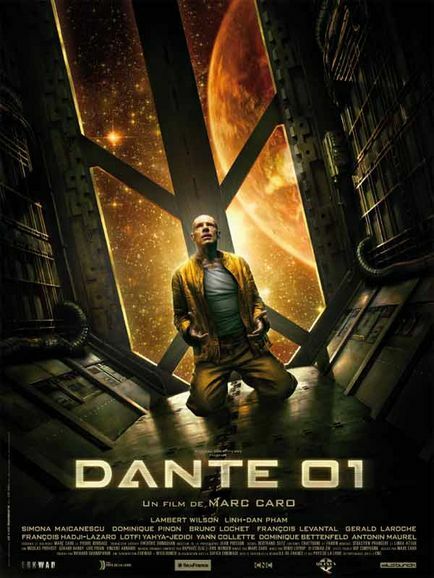 I have not seen Dante 01, but I will definately netflix it. Dante 01 is the most explicitly Christian movie made since The Passion of the Christ. And it hails from France?! btw, that’s not a youtube edit of the final scene – it actually goes on that long and that repetitively. the only part they don’t show is that after he disintegrates at the end, the “hell” planet that the station is orbiting turns into a green inhabitable one. are you kidding me!! what a video! that last comment was from Drake. sbrbaby thought it was a little scary! I just watched the video…what kept recurring to me was a cruciform and a face that looked straight off of the Shroud of Turin. Very cool!